It occurred to me today, as I sipped my second cup of coffee and looked out on a winter wonderland, that there really is a dearth of information regarding the appropriate care of LGDs in very cold weather. I live in a part of Canada where we often see the extremes of both ends of the thermometer. We have high temperatures with higher humidity in the summer and very low temperatures with dry air that cracks your skin in the winter. 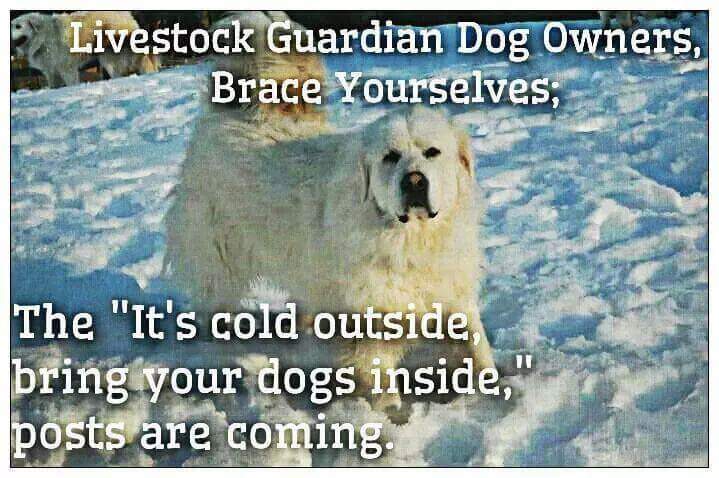 This type of exceptionally seasonal climate is one of the more challenging places to keep Livestock Guardian Dogs. Even if you don’t experience winters where the mercury regularly dips to -40 or more, but you live where humidity is higher, if you’ve move recently or if your seasons are changing dramatically with global warming, you may wonder how to tell if your LGD is adequately provided for. The advice provided by the pet sector, which is the most readily available information, often leads people to the wrong conclusions. While perhaps well intentioned, most pet and shelter suggestions given out at this time of year focus on the dog that was never intended to handle cold climes: the small, slight, single or short coated dog. They then extrapolate that information to all dogs in the hopes that people will err on the side of caution. Sometimes, they get the information wrong for farm animals and dogs alike. Memes like the ones below just make things worse. Information like this relies heavily on anthropomorphism which is the notion of ascribing human attributes to something non-human. “If it’s too cold outside for you, it’s too cold for them.” is the ongoing mantra of this movement – no matter how illogical that sounds. Dogs are not built like humans, don’t think like humans, and some really prefer to be outdoors rather than confined to a hot, stifling house. For us producers, an acknowledgement that LGDs are not, in fact, pets, and that they have a job they’ve been equipped to do outside regardless of the weather would go a long way towards healing the rift between farmers and the pet sector. The more responsible we are about recognizing what our dogs need in extreme weather, the more we will help to head off any Nosy Nellies who want to know how we could be so cruel as to keep dogs outside year round. Let’s talk a bit about that responsibility. From my point of view, the most important thing we can do for our LGDs is to choose dogs with a coat type that can handle the environment they are expected to live in. No matter how much you like the look of a certain kind of dog, if they are not equipped to live outside all year where you are, it is unethical to require them to do so. Very short coats are not appropriate for working in extreme weather. Single coated dogs are very susceptible to weather changes and typically only do well in very hot climates without extensive care; therefore, all LGDs should have double coats. Double coated dogs have exactly what you’d expect from the name: two coats. The outer coat is comprised of longer guard hairs that are naturally water repellent. They retain this coat throughout the year. Underneath grows a slightly shorter plush and fleecy coat that traps warm air in the winter and retains it close to the dog’s skin. In essence, the properly double coated dog wears a downy, weather repellent coat all of the time – a perfect accessory for living in the cold. Contrary to what many people think, this coat serves equally well to keep the dogs cool in summer, shedding out when the warm weather comes to allow maximum air flow close to the skin. The double coat comes in short, medium and long versions. I personally feel that any dog who is meant to live and work in extreme conditions should have at least a medium length double coat. Take your cues from the predators who live in your area – what length of coat do they have? This should be the minimum coat on your dogs. The last thing you want is for your dogs to be handicapped by needing to be more concerned about keeping themselves warm than defending the flock. Dogs with overly short coats for their environment will spend more time seeking warmth and will need to eat significantly more than dogs who are able to retain more of their body heat with longer coats. It’s important to note that not all LGDs here in North America have been bred with proper weather resistant coats, even if they are double coated and of a good length. A good example of this is the “cottony” coat that has been bred into many show Great Pyrenees and that finds its way into the working populace. This coat requires extensive grooming, mats easily, absorbs moisture instead of shedding it and consequently does not serve to keep the dog warm in the winter or cool in the summer. When freshly groomed, this coat resembles a cotton ball and consequently often has to be shaved in the summer to avoid matting completely. A proper double coat, regardless of length, will shed out on its own twice a year, will be very self cleaning, and will require only minimal annual or bi-annual brushing. Ivy models her mid-length double coat in the winter. Her coat is ideal for this length, keeping her very warm through to -50 (along with access to insulated shelter) and shedding any dirt or debris on its own. Bolt’s winter coat as pictured in the blog header is another proper, mid length coat. How do we know if a LGD’s double coat is doing its job in the cold? The easiest time to check at a glance is when it’s snowing. If the snow lands on the dog and remains intact, not melting, the coat is working well. If the snow turns to water, this means that too much heat is escaping from the dog’s body and melting it. Sometimes a puppy coat can do this but correct itself when the adult coat grows in; more often the coat is appropriate from the beginning. Ivy (back) and Anneke (front) show off their mid length winter coats. Anneke was approximately 7 months old in this photo. Even the most well coated dog can have trouble staying warm in the very extremely cold weather, especially if it is prolonged. It is important to remember that even if the thermometer reads only a moderately cold temperature, the wind can drive that number much lower. For this reason, a windbreak of some kind is crucial if a full shelter cannot be provided. Since most LGDs prefer to stay with their stock (who also help to provide body heat), a windbreak for everyone will be more readily used than a stand alone dog house under these circumstances. Extreme weather requires the dog to burn more calories to stay warm, just as it does for livestock. Apart from changes to the environment, if your dog continues to have trouble keeping weight on in the winter or begins to shiver, consider increasing the amount of food they are fed daily. Feeding twice a day instead of once, adding a bit more fat and/or carbs, and adding warm water to the food are all ways to tackle this problem. Thirst increases in the winter as well, making free access to liquid water a necessity. This helps ensure that the dogs remain healthy and that their digestive systems continue to operate properly. Provide warm bedding, especially bedding that has insulating properties and doesn’t easily trap and hold moisture. We use straw here, since it is plentiful and fits the criteria. Only consider providing a coat for your dog as a last resort and only in the most extreme weather, as it can interfere with their ability to acclimate to the elements. It may be tempting to bring your dogs inside to the comfort of your heated house. In my opinion, it is better to allow them free access to a heated spot outside. Our houses are kept at almost unbearable temperatures for properly coated dogs who have acclimated to living outside. A heated portion of an insulated building or a heating mat are much better options. It is also very difficult for a devoted LGD to protect and nurture their charges from inside the house. A pair or multiple dogs may well do much better in the winter than one. They are much more likely to get moving, through play or patrolling, and keep their bodies more limber and warm than if they were to lay around all day. They are much more likely to work together against predators and as a result be able to conserve as much energy as possible. A well rested, well nourished dog who is not anxious about their ability to drive off predators will be a much more effective guardian year-round. Both age and health problems will compromise the ability of a dog to regulate their body temperature outside. The responsible producer will keep these in mind when assessing the condition of their dogs in the winter and make changes accordingly. Read about age, compromised health and complications here. Humid cold weather will affect dogs with arthritis much in the way it affects humans with the same condition. It is best to work with a vet to address this problem if at all possible. For further reading, click here. It is more important than ever to check LGDs over from head to toe frequently in the winter. In this way, you are likely to find any problems early on and be able to address them before they get worse. Cold weather slows wound healing, as mentioned in Merck’s “Wound Management”. Keep a close eye on any wounds and their healing process. Be proactive in contacting your vet if you notice anything amiss. If your dog’s feet gather a lot of snowballs during parts of the winter, trim the hair on the bottom of their feet. Further reading on LGDs and cold weather can be found here. A good post regarding cold weather and other types of dogs can be found here. Categories: Health, LGD General, Uncategorized | Tags: bring them inside, cold weather, dog cold weather, dogwinter, farming, LGD, LGD cold weather, LGDs | Permalink. LGDs and Right vs. Wrong. Yesterday, a concerned person alerted me to the fact that I was the latest target of a notorious troll blogger and that she was using my pictures without appropriate permission. As this particular author is not generally well regarded in the LGD community, I wasn’t terribly concerned until I took a good look at the post. With over a 100 shares (which is still much less than I’d expect from such a long time member) and a link in the post directly to my personal FB page, I feel like it is important to answer some of her allegations. Here is the latest installment, if you have time to waste and don’t mind reading through reams of arrogant, rage-attack nonsense. According to Brenda Negri, it would appear that if you don’t agree that she knows everything about LGDs and pay homage to her as the queen founder of all LGD knowledge in North America, you are setting yourself up for endless bullying and harassment. I’d hardly heard of Negri except in passing before I decided to begin blogging about LGDs. I had read one of her posts where she imparted a seemingly endless list of gripes she had with LGD owners; it read to me as authored by someone uber focused on blaming and negativity, so I ignored it. Shortly after I published a few posts on here, though, she showed up in the comments section to chastise me for using a photo of hers without permission. As I have no desire to infringe on any copyrights and aim only to use photos for educational purposes, I replaced that photo immediately. That was not good enough for Negri, as she continued to post long messages about the infallibility of her longstanding wisdom and how I had failed to recognize it. I dealt with the comments as I felt appropriate and considered moderating all comments to Guard Dog Blog. I really don’t like to censorship, so I decided against it. Negri’s recent post about her idea of right and wrong was a difficult read for me, I won’t lie. Even though harsh criticism is to be expected when you work with dogs, I never quite get used to the nasty things that some dog people will say when it suits them. I have also done my share of critical posts, however, and I do realize that it is important to read them with an open mind – even if I happen to be the subject. I’ve tried my level best to look at her post objectively, but it still comes up as petty and inaccurate. Negri makes the occasional good point, but they are quickly lost in the vitriol. As I really don’t want to give Negri’s writings more attention than they deserve, and seeing that a thorough reading of any of my posts should sufficiently prove these allegations false, I’ll just reply to a couple of them. Her post addresses others in the LGD community – some whom I know fairly well and others that I only know peripherally. I can only answer for myself, but I do urge any reader of Negri’s blog to do their own independent investigations. Some things are rather obvious about how she works, though. For instance, claiming other people’s photos as her own copywritten work (as written at the bottom of her blog screen:”All material copyright Brenda M. Negri, 2015. All rights reserved”) indicates that she doesn’t mind behaving as a hypocrite. Negri breaks her attacks against my work into two sections in this blog post. I suppose I should be flattered that she found me so interesting as to draw not one, but two segments of note. The blue emphases are lifted directly from her blog post and link to various Guard Dog Blog posts as well as to my FB pages. In fact, the post referenced outlined tools that are used with LGDs, although not necessarily endorsed by me – especially their indiscriminate use. 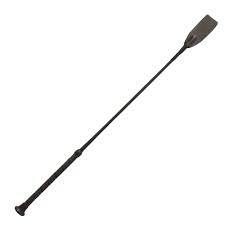 I do use some of these tools – have never made any bones about that – but some I do not. I do not expect that others train exactly in the way that I do, nor that they even train their dogs to the same extent that I do. It is my belief, however, that it is better to talk openly about certain tools that people use – evaluating their pros and cons as objectively as possible. Different circumstances and different dogs can require different training techniques and tools. It’s a poor trainer who does not acknowledge this. Under the bold heading in red ink: “WRONG: LGDS SUBJECTED TO WEATHER EXTREMES WITH NO OPTIONS FOR SHELTER”, is a link to this blog post and a rant about my use of e collars as well as the fact that I am a dealer (which is very common for dog trainers, dog behavior experts, dog business owners, etc.). Negri appears to fail to understand that not only do LGDs come from places other than Spain, but that the circumstances that LGDs are kept in in their homelands are very different than those in most operations in North America. It would follow that other training techniques and methods would come into play. Not only that, but the assertion that “LGDs work from instinct” alone seems to be in line with what Coppinger claimed. Negri comments over and over elsewhere that she does not agree with Coppinger that instinct is all that is needed.. Which is it, then: are LGDs trained to do their jobs or not? Do they work only from instinct or do they require training in addition to instinct as all dogs do? If the latter is the case, then an e collar can justifiably be brought into the conversation as a training tool. Perhaps it is Negri’s belief that LGDs should only learn from “pack” members, but she cannot refute that the vast majority of LGD owners here do not have access to older training dogs… and even if they do have older dogs, they may not train the pups effectively. Shepherds all over the world train and control their LGDs. They may rely on their older dogs to help with the training, but they remain present, provide oversight, back up and refuge as required. Dogs and shepherds work together to keep the flocks/herds safe. I am used to being under attack for my position on e collars, as many of my friends are as well. Attacks like these are an unfortunate side effect of committing to what is best for dogs and not just what political winds prevail at any given moment. However, Negri’s assertion that I endorse or even keep dogs in cold conditions without access to appropriate shelter is a complete falsehood. I have never said anything of the kind, and all of my dogs have continual access to shelter. I live in a very cold winter climate – much colder than the one Negri lives in – and keeping all of our animals warm, fed, watered and cared for here is no small task. My family and I, along with the producers I know and respect in Canada, work very hard to ensure that our animals, including our dogs, want for nothing despite the cruel climate. If Brenda M. Negri wants to be taken seriously at all, she ought not to assume she knows anything about living and caring for animals here. A view of the shelter in the winter pasture: an insulated barn stocked with deep litter that is spot cleaned and replenished throughout the winter. The litter (aka bedding) over time begins composting at the bottom most layers, which produces heating. The sheep and the LGDs have round the clock access to this building. Ivy’s greeting in the barn during February, a particularly cold portion of the winter (as evidenced by the clothing in the picture). The door to the barn is partially closed, with a hanging curtain to keep out the wind. We even choose to coat the lambs born in the coldest time of the year and keep them under a heat lamp for the first day or two. Here, Ivy meets the newest 2015 flock member. Brenda Negri claims to be an expert on LGDs, their behavior, their needs and their training, wherever they may be found. She may well know some things about LGDs, but I remain unconvinced of her expertise, no matter how long she has had her breeding program. I do not build my blog on ad hominem attacks, baseless accusations or twisted rants, nor do any knowledgeable people I am aware of – and there is a reason for that. Consistently attacking other people is a refuge of the weak. It may work to gain short term recognition, but it never holds up to scrutiny. A well written, thoughtful examination of who and what coyotes are – to us and to the environment. I was so glad to hear this Canadian sheep farmer advocate for the use of LGDs. His story is one we commonly hear from long time farmers and ranchers, and Denis tells it so well. Follow the link to hear the full story. Winter is Coming. Brace Yourself. I wish I knew who composed this meme as it’s spot on. Share this with your friends and family and help them to understand that dogs with proper coats and access to shelter are not suffering in the winter. In fact, most LGDs LOVE snow and the cold weather. They’re built for it. Plus, what’s more cozy that curling up with a bunch of small ruminants? Not much. ***A little tip: If the falling snow is sitting on the dog and not melting, that dog is properly insulated. Plunging your hand into their fur will find a nice, warm perfectly happy dog. I don’t recommend doing that with any that aren’t your own, though.